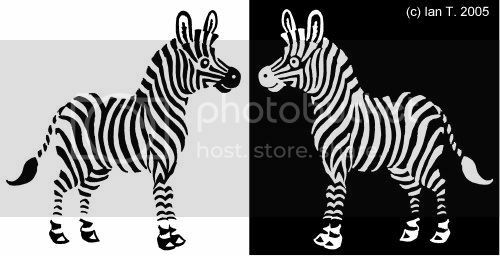 A black horse with white stripes or a white horse with black stripes? Actually, neither, just the plain old, fancy-looking zebra! This is my picture for Illustration Friday this week, on the theme of "Black and White." I started with a sketch in pen and brush, scanned as a pure 2 bit black and white TIFF, then cleaned up a little. Of course, I had to eventually scale back to a greyscale JPEG to put it online, but I think it's still as "pure" as I can make it. In the sketch I had outlines around the legs, but when I viewed the reversed image I knew these had to go, as they contradicted the logic of the design. All in all it's not to far from my stripey fish for "Aquatic." Lately, I have a bit of a fascination with shapes and objects expressed as linear forms. Sometime soon I hope to put up a page from "Moth & Tanuki" #4, which really shows it in action! Update: Been there, done that? Check out the T-shirt! Those zebras are just too darn cute. They look like they might be from parallel universes :o) I love your take on the theme and your execution! This is a very sweet image. I like the pos/neg reversal , too. I guess animals have been a popular theme for this topic, as I've seen quite a few black & white animals these past few days (and they're all fabulous!). Thanks for the kind words about my b&w dog pic. great illustration! perfect subject for this week's topic. oh and thanks for your comment on my submission - you hit the nail on the head! Poor little zebras, in opposite dimenstions, can't even touch! Bee'nme & Tony - maybe the zebras could get together, but if they stood next to each other they might disappear into white, or black... or maybe grey! Rebeccashane, those hoofs are a bit of an anomaly - I couldn't get quite the right answer. Thanks for being okay about the lettering comment. Kerry, thanks, I hadn't thought about stencils! JacqueLynn, getting the balance of stripes to balance both ways was the real challenge! I did a little tweaking on the computer, but not much. Burchell's zebras have a good natural balance of black to white, apart from the muzzle and tail-tip, but some others are quite different. I'd love to see St. Louis zoo! Fern Lady, I think animals (and birds) are terrific for rendering in b&w, even if it's not their natural colours. I really like your dog pic - it has wonderful warmth and would make a lovely card design. allison, I'm glad I read your suits right :). Actually, maybe a suit makes you turn grey, then disappear! I love your choice to mirror the image and make one the negative of the other. Really cool looking!